A quaint country setting with its own native animal wetland. Please call first to make booking. Full kitchen,.Pot belly and electric heat. Cosy and romantic.300 metres to pure white 10 klm long untouched beach. Small boats can be launched here to access the lobster and flathead fishing grounds in the area. As well as friendly locals. The East Coast offers by white beaches, secluded, sheltered bays and spectacular headlands. It is Tasmanias sun coast, edged by crystal blue waters and clusters of holiday homes that have tied generations of families to annual bouts of rest and recreation. And the East Coast beckons you to explore beyond the shore and beneath the sea to giant kelp forests and caves, or even further to the continental shelf, where the big game fish run. All along the coast, bright beaches blaze, and the distinctive blue-green East Coast sea washes the shores. Grey-green sheoak trees dapple the ground with cool shade. In the ocean beyond, whales follow ancestral migration routes, dolphins frolic and sea birds wheel on the wind. Inland, rainforest clings to steep mountain passes, and the steep rock buttresses of Ben Lomond frown over the rich farmlands of the Fingal Valley. Each place has its own surprises - sapphires panned from old mines near Branxholm and Derby; farm cheese at Pyengana; skiing and walks on Ben Lomond’s craggy heights; echoes of a mining heritage at Derby and the Blue Tier; a desert of golden sand dunes at St Helens; rough-cut local granite in the towering Eddystone Point lighthouse; sweeping views of forests and farmlands as the Mathinna road descends to Fingal Valley. Noted surveyor, John Helder Wedge, first explored the area including Scamander in 1825. The present township is at the outlet of a large river, which proved a real barrier to early travellers, especially Wedge. Originally it was named Borthwick; then Hansons Creek; and finally the Scamander River, its official name today. Situated in the middle of the East Coast, Douglas-Apsley National Park is Tasmanias newest park. Spectacular river gorges, waterfalls, tranquil pools, large stands of dry eucalypt and pockets of rainforest combine to make a visit to the park a memorable experience. Fishing like you wouldnt believe. Amazing views of North and South Sisters and St Patricks Head.Tennis ,golf and pristine white private beach all close by. Good and just right for our needs. Loved being able to have the dog with us. We really enjoyed our stay at this property. It was clean and the bed was comfortable. Both the estuary and the cliff walk were within easy walking distance. Blitz was a lovely and non-intrusive host and we appreciated the breakfast he left for us. We will certainly stay there if we are in the North East again. My wife & I found the cottage very homely & comfortable, we felt right at home as soon as we entered. Blitz is a great host, friendly & accommodating. 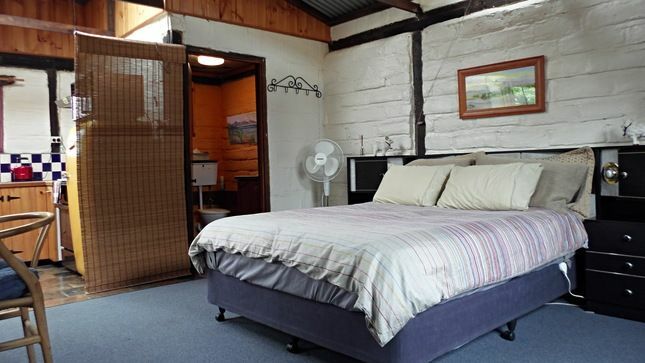 We would recommend this accommodation to couples who like the mud brick, retro style of holiday accommodation. Falmouth is a beautiful, quiet place to go, central to many east coast destinations. 11 out of 10 in our opinion. Blitz was a wonderful host, from meeting us when we arrived to show us around to bringing us breakfast supplies every day. Every need was catered for, we arrived on a really hot day and Blitz was wonderful enough to have the windows open and cooling on and have chilled water ready for us. A very generous breakfast was supplied every day as well. Within walking distance to the beach, few minutes down the road from a brewery/winery, it was a great base for exploring the east coast of Tassie! Looking forward to returning soon! My partner and I had a wonderful stay! Thank you so much! This little shack is perfect for couples. It’s beautifully serene and has everything you need to make your own meals and chill out. We loved our stay! We wanted to be near our son for his birthday - he has a very small holiday home in Falmouth - not enough room for the Grandparents. Woolybutt was ideal for us, and we will use it again for family getogethers. Had everything we needed for our three night stay. Couldn't ask for anything more, except perhaps screen door. Blitz made us feel very welcome.